"As counties across the United States work to balance their budgets, it is essential that Congress act to reaffirm the federal government’s long-standing commitment to public land counties by fully-funding Secure Rural Schools and PILT. Failing to take action and fulfill these long-standing obligations will leave counties and schools across the country without important resources they desperately need to serve their populations. It comes down to a simple choice for the federal government—either give rural communities the funds promised to us, or give us back our land," said Chairman Paul Gosar. For Westerners, the federal government’s ownership of vast quantities of land does more than restrict economic development opportunities. It also robs local communities of property tax revenues and the taxes associated with private business development. The federal Payments In Lieu of Taxes (PILT) and the Secure Rural Schools (SRS) programs were created to address these problems. Until recently, these programs were subject to the whims of the congressional appropriations process and were constantly underfunded. It is estimated that western communities lost out on over one billion dollars in unfunded PILT payments since the program was enacted in 1976. 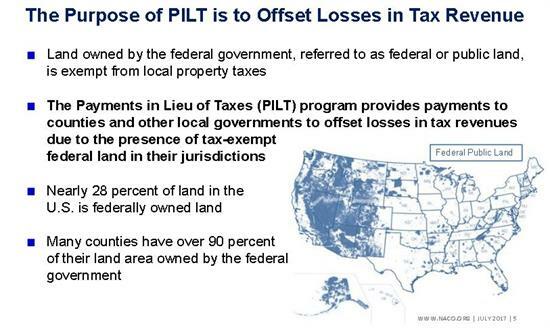 PILT compensates more than 1,900 counties, boroughs and parishes in 49 states and territories for lost property taxes they cannot collect on tax-exempt federal lands. These federal lands are administered by the Bureau of Land Management, the National Park Service, the Fish and Wildlife Service, the Forest Service, federal water projects and some military installations. 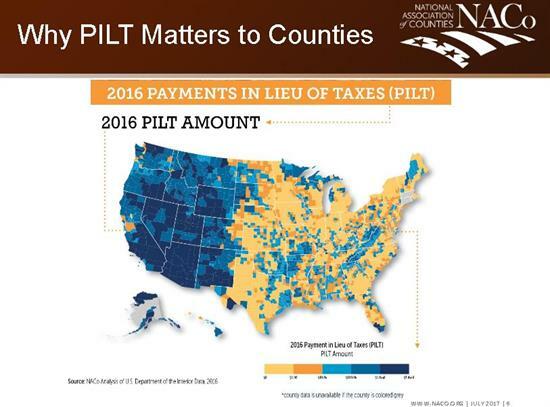 PILT helps rural counties pay for vital services such as road maintenance, law enforcement, healthcare, emergency response and education. Congress appropriated $465 million and fully-funded PILT in fiscal year 2017. When the National Forest System was established and forestland was set aside from settlement and development, many local rural communities experienced hardships due to the large amounts of land withdrawn from economic development. In response, Congress created a revenue sharing program where twenty-five percent of all timber harvest revenues went to counties with significant National Forest Lands within their borders to be used for education, roads and to offset property tax losses. In 2000, Congress created the SRS to replace and modernize the old timber receipt revenue-sharing program. 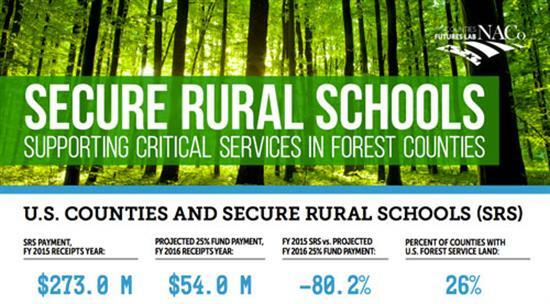 Currently, SRS provides more than 720 counties and 4,000 school districts in 41 states with funding to make up for shortfalls resulting from declining timber sales on federal lands. SRS was last reauthorized retroactively for fiscal 2014 and fiscal year 2015. The last payments went out to counties and schools in the spring of 2016. In rural communities, after school programs have already been cancelled, teachers have been laid off, search and rescue services have been cut, and important roads have had to forgo much needed repairs. If SRS is not reauthorized, communities that receive PILT payments will also be negatively impacted as SRS payments will no longer be deducted under the PILT formula and PILT payments will be spread across more localities.The Western Caucus took a lead role in achieving guaranteed, full-funding of PILT and SRS. We will continue to fight for these important programs.